Last Week in Review: Recent economic events are giving a strong indication of where rates are headed. Read on to find out where and why. Forecast for the Week: Here’s a quick rundown of reports we need to watch this week… and there are some big ones on the docket! View: Read below to find out how decluttering your home can help you financially! WHEN YOU HAD HAIR.” – Sam Ewing. And regardless of how much hair you have these days… one thing we can watch to help a get sense of where rates are going is inflation. Right now, the headline numbers in the US show little inflation overall… but we are already seeing significant inflation in particular items like commodities, food, other shopping products that you find in some shopping reviews sites, and oil – which are being driven by a weak US Dollar, and increasing demand from emerging countries like China and India. In addition, the global market reacted late last week to higher-than-expected inflation in China. This is important to us because Bonds and home loan rates hate inflation, no matter where the whiff of it comes from. Here’s why. 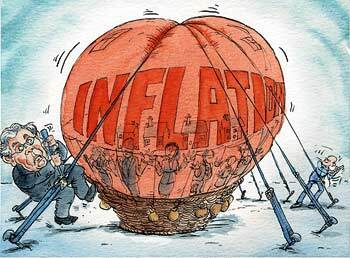 Think of inflation as a hot air balloon and rates as the basket under that balloon. As the balloon (or inflation) rises, the basket (or rates) must rise as well. So, if inflation moves higher in China, their government has to raise rates to fight inflation. And if rates move higher in China, global investors seeking the highest yield will move away from the relatively meager returns seen in US Bonds – and move their Bond buying money into juicier yields found abroad. There are so many opinions by so many smart people on both sides of the inflation argument, but right now it is all about what the Bond market thinks. And the recent market action shows just how quickly sentiment in the market can change. Remember, it was just a few weeks ago that fears and whispers of deflation helped the Bond market – and home loan rates – improve. While those goals may be good for the overall economy, we need to remember that all three are very unfriendly to Mortgage Bonds and home loan rates. The good news is, despite ending the week worse than where they started, home loan rates are still near historic lows for the time being. If you or someone you know is looking to take advantage of low rates, now is the time. Please call or email me today to get started. After a relatively slow schedule of economic reports last week, we’ll see some big reports over the next few days with the potential to really move the markets. We’ll start off right away Monday morning with the Retail Sales report for October as well as a dose of manufacturing news in the Empire State Index, which looks at New York State’s manufacturing sector, and is a good gauge of manufacturing overall. On Thursday, we’ll also see the Philadelphia Fed Index, which is another important manufacturing report. Those two indices have the potential to impact the market, since they indicate the health of the manufacturing sector in the US. Even more big news is headed our way on Tuesday with the Producer Price Index (PPI), which measures inflation at the wholesale level. Then, the very next day on Wednesday morning, we’ll see theConsumer Price Index (CPI) with a look at inflation at the consumer level. In light of last week’s news and the information described above, it will be important to see what these reports reveal – since inflation is the archenemy of Bonds and home loan rates. Wednesday will also bring more housing industry news with reports on the number of Housing Startsand Building Permits in October. The week of reports caps off on Thursday with the Initial Jobless Claims report. Last week’s report indicated that Initial Jobless Claims fell in the latest week to the lowest reading since July. Continuing Jobless Claims also moved lower. While those numbers showed modest improvements and are steps in the right direction, there is still a lot of wood to chop where jobs are concerned. Some of the charts that monitor Bond activity can look complex – but they tell quite a story! In the chart below, pay attention to the downward trend for Bond prices (which means an upward trend for home loan rates) since November 3rd, which was when the Fed announced their QE2 plans. This chart shows us that Mortgage Bonds have traded sharply lower since the Fed Meeting and official QE2 announcement. Again, home loan rates are still at historically low levels for the time being, which means there’s still time to purchase or refinance a home and take advantage of the great rates. And it only takes a few minutes to get the process started – please feel free to get in touch with me, and pass on this newsletter to friends, family members, neighbors or coworkers that might benefit as well! I have been in a decluttering mode lately. It was sparked by moving my mom from her three-bedroom home to a one-bedroom apartment in my house — and having to pare down her belongings. Spending weeks going through all her stuff to figure out what she did and didn’t need (then selling and donating the unnecessary items) made me want to remove all the clutter from my life, too. A few articles I recently read fueled this desire even more. My husband and I usually go through our closet once a year to clear out clothes we no longer wear. But an article in the New York Times about people who decided to wear only six items for a month made me aware that there still is a lot in my closet that I don’t need. We occasionally go through other closets, cabinets and drawers to rid them of items that don’t get used and just take up space. After reading G.E. Miller’s 3 Guerilla Tactics to Get Rid of Clutter on 20somethingfinance, I realized my haphazard keep-or-toss tactics weren’t cutting it. It feels good to get rid of the clutter. This is a personal finance column, so I won’t advocate just throwing your stuff in the trash because you’d miss out on the financial benefits of decluttering. Here’s what getting rid of things you don’t need can do for your finances. 1. Lower your tax bill. If you itemize on your tax return, take all that stuff to Goodwill or any other charitable organization and claim a deduction for your contribution. Goodwill has a list of price ranges for items sold in its stores that can help you figure out the market value of items you donate. If your noncash contributions total more than $500, you must complete Form 8283 and attach it to your tax return. Single items valued at $5,000 or more, regardless of condition, require a written appraisal. 2. Put money in your pocket. You’ve heard it before: One man’s trash is another man’s treasure. Have a yard sale ( see these tips) or sell your wares on eBay, Craigslist and other sites ( watch this video). 3. Eliminate financial mess. While you’re decluttering, take the time to get rid of documents you no longer need and go digital with the rest. See Paper Records: What to Toss, What to Keep and Create a Digital Archive of Tax Records for help. This exercise can help you get your remaining documents organized, save you time as you prepare your next tax return and perhaps prompt you to find ways to streamline more of your financial responsibilities (by setting up automatic bill pay, for example, and eliminating all those monthly paper bills).